Intriguing to consider the fundamental difference between place-based virtual worlds (like Second Life) and toolkit virtual worlds (like Cobalt) – what implications does that distinction have for communities of practice? The importance of the new WebGL web standards which, according to folks at the conference, will be available in most browsers in the fall 2010. This will allow for one click (no plug-in) entry to immersive 3D spaces. The need to develop habits of mind with regard to this new media, as opposed to being a tool-thinker. That is, learn to be a smart innovator. If we can develop good thinking habits about immersive education possibilities, we will be able to approach any new technology that comes along with a smart experimental method – and harness it. And, for me, the grand poobah lesson of them all is recognizing the risk of totalism. With a full banquet of possible virtual worlds at this meeting, I was able to remind myself that strict adherence to one vw or another is not productive. The speakers and participants at the conference who were zealots for one platform/one choice sounded shrill and scary. While those that advocated exploration, investigation, and multiple solutions sounded sensible and compelling. It’s not going to be easy to effect change in education with virtual worlds (it’s never easy to effect change in education) but if we insist on a single solution (Cobalt or ReactionGrid or Wonderland), we will lose before we even begin. 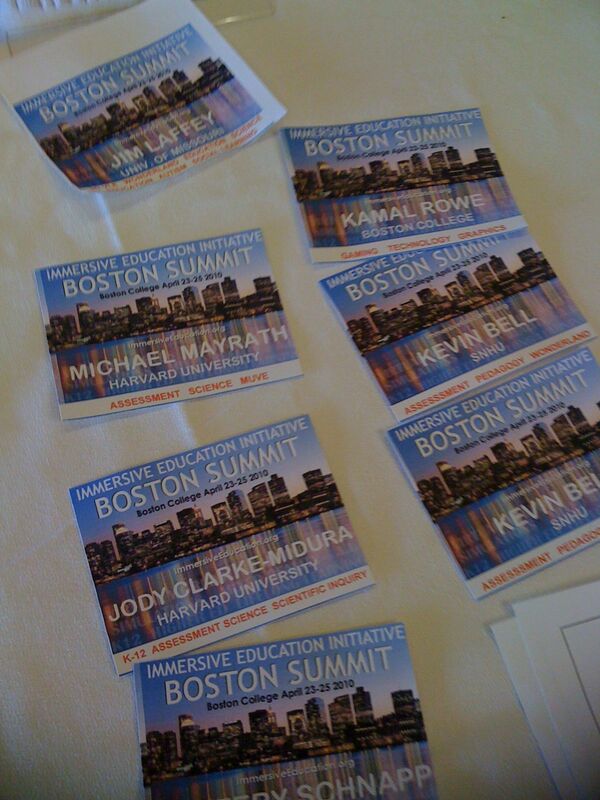 Here’s my recap of the Immersive Education (#iED) Summit’s Day 2 -the second half. Thanks for hanging in there with me on this, gang…I know these posts are looong, but there was just so much going on! Over lunch Ed Boyce (from Duke University) got me up and running in Cobalt in about 10 minutes. Very, very easy. You download the application here and enter the world. You can drag and drop any kmz file right onto the environment you’re in and then right click on it to put it in edit mode (to resize, move, rotate). You can get a feel for process in these two pictures. La Louvre dropped into my space in Cobalt. 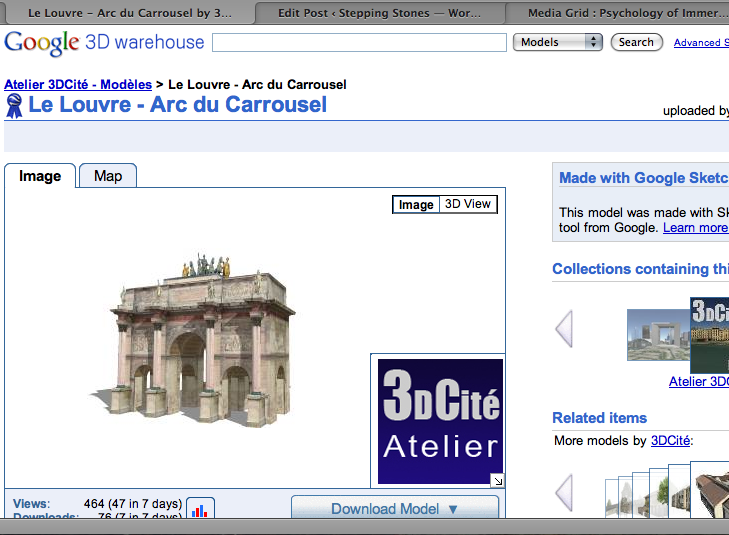 Here, on the left, is a screen shot of Google’s 3D warehouse where I grabbed a kmz file of a build of La Louvre. To the right, you can see that I’ve dropped the Louvre kmz file into my avatar’s space in Cobalt. Very cool. I love the idea of drag and drop building like this. You can see how one could easily render a quick and relevant 3D space for learning, meetings, collaborations, whatever. Once you’ve built it, you name the space, and then generate a directory link to it. You share the directory link with whomever you want to invite to your space and they join you there. Easy breezy. Right after lunch, Richard Gilbert (Loyola Marymount University) gave a fascinating talk on the psychology of immersive worlds. This is one that I had circled and starred when I first reviewed the conference agenda. Gilbert, who is on the Immersive Education board, set out his goal to talk about the human and cultural dimensions of immersive worlds and the impact of the technology on users and culture. 1. What are the characteristics of active participants in virtual worlds (demographics, personality, mental health characteristics)? 2. Do the principles of psychology that operate in the actual world also operate in the vw? 3. Do experiences in virtual worlds have the capacity to influence behavior and subjective experience in the real world? He described two examples of research where the principles of psychology in the actual world, apply as well to the vw (organizing yourself in physical space, changing behavior based on seeing someone else rewarded). He also referenced the research of a Stanford grad student where subjects watching their avatar exercise (on a treadmill), increased their own exercise in the actual world as a result. 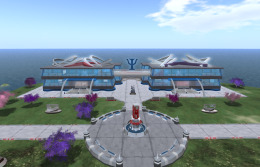 On LMU’s virtual research island (in SL) Gilbert and his team conduct psychology research. They recently conducted surveys with over 800 avatars in-world, looking for subjects through SL groups and various leaders. The LMU team screens their subjects – looking for avatars who have been in SL for at least six months (more stable usage patterns) and pay them in Linden dollars (1000L). Subjects come in, sit at a virtual terminal, see a drop down menu for a number of studies, select the study they are there for, and are connected to their survey in a browser. The completed survey is submitted and downloaded to a statistical engine. Some candidates are also interviewed. Here are the studies that Gilbert and his team are working on now: The first study explores the prevalence of addiction to SL and it’s co-morbidity with real life addictions (this one will be appearing in Journal of Addiction Research). The second study looked at sexuality in the 3D world and its relationship to real world sexuality. A third study looked at intimate relationships in the 3D world – communication patterns, satisfaction levels, and comparison to real life relationships. A fourth study looks at psychological and social adjustment of active users of SL. A fifth study looks at personality characteristics across multiple identities of self, primary avatar, and alts by asking subjects to complete a survey of psychological characteristics of themselves, then the same survey considering their avatar, then their alt (30% of SL users have more than one avatar). Gilbert reports that the two physical variables that people most often modify on their avatar are eye color and weight. The sixth study looks at the impact of SL on individuals with significant RL disabilities. This last project surveys new SL residents (within the first week) and then again in 3-4 months to see what impact being able to interact with others through a different lens than that of their disability has on the human driver. They’ve intentionally aimed to publish all of their findings in mainstream psychology journals. Gilbert co-chairs Immersive Education’s Psychology of Immersive Environments Technology Working Group. He’s looking for people to join their collaboration, if you’re willing to participate in their basic and applied research. In addition to ongoing conversation about the studies he described, the working group wants to gather a central bibliography and to identify and promote beneficial psychological practices in virtual worlds. Unfortunately, Gilbert didn’t talk about any of his results in these studies (big disappointment!) but I, for one, will be looking for his published articles. In the Q/A session, someone asked him to sum up what he thinks the avatar represents for most human drivers – his response: the avatar represents an idealized self for most people. A few people in the audience mentioned how put off they are by the “sexed up” look of many of the avatars and how problematic that is for them with their institutions. When asked about vw projects that involve students, Gilbert talked about two interesting sounding builds. The first is Dream World – a gigantic 3D brain with an escalator (immersive equivalent of the spinal cord). You enter the brain, where you are transported to a place called the Dream Museum which is a multimedia exhibit created by an interdisciplinary collaboration among psychology, graphic arts, and computer science students. He also talked about a new build called Language Island Promenade where they’ve built a replica of the actual world promenade in Nice. Students are invited to an immersive French experience. Stephanie August (also from Loyola Marymount) talked about additional builds they’ve made in SL under a National Science Foundation grant. Stephanie described their tentative plans to migrate from SL to the Education Grid. She talked about issues of support, stability, and standards. One of the factors driving them to the Education Grid is cost – while SL is free downloadable software, in order to build you have to rent land (with annual fees). Their university gave them start-up money but are not funding that ongoing, additional annual expense. They are going down the road of portability – that is, building their assets so that they can be platform independent and migrate when they need to. Next up, Isaac Peal (who is a Boston College student) masterminded a session to demo the sim Virtual Harlem (in SL) with Bryan Carter , University of Central Missouri (SL=Bryan Mnemonic), who was in-world for the presentation. 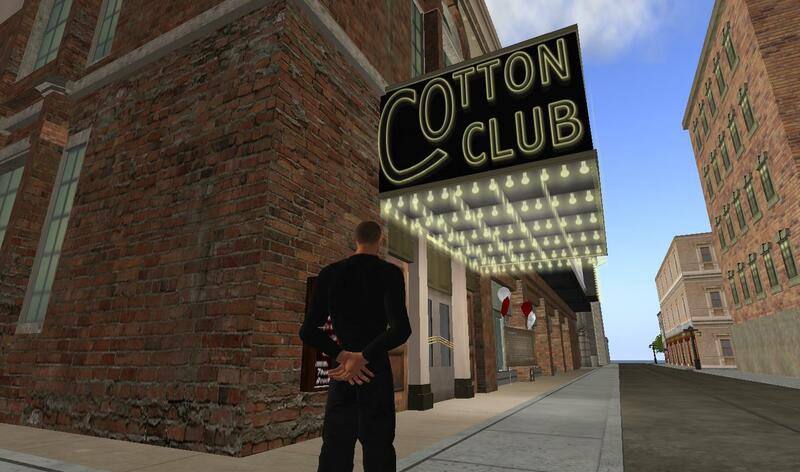 The first version of Virtual Harlem was built in 1997 – the goal was to create a 1920-30’s version of Harlem. Recreations of various historical locations like the Cotton Club, the Apollo Theater (including performances there), the Savoy Ballroom, and period-based businesses serve as a perfect sandbox for teaching about the Harlem Renaissance and this important chapter in African American literary history. 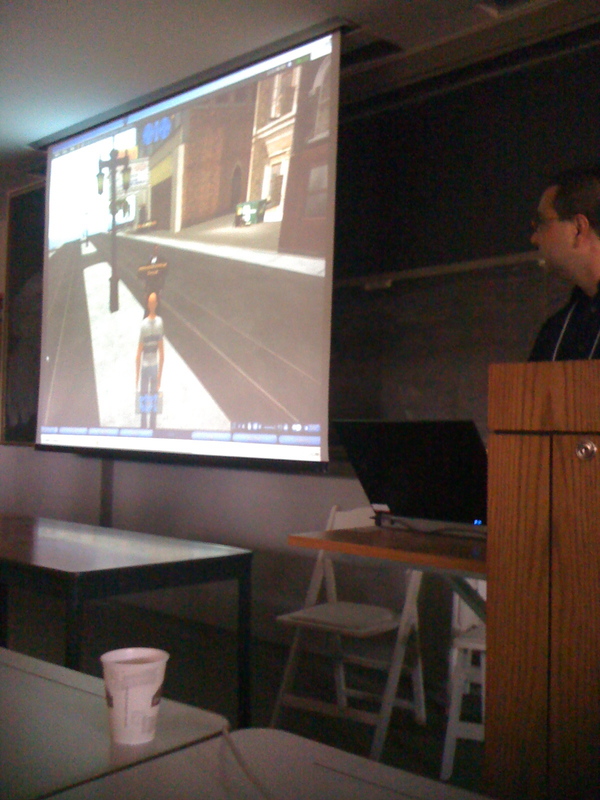 As a next step for the project, they will migrate various portions of Virtual Harlem to the Education Grid this summer. Bryan explained that the two locations will continue (SL and Education Grid) and should compliment each other. The Education Grid instance will allow educators to bring younger students into Virtual Harlem. Bryan provides information about his english courses are taught in SL on his blog site. After we talked with Bryan in SL for a few minutes, Isaac demonstrated the process for migrating SL builds to the Education Grid. He used the viewer Meerkat to do this (Meerkat is discontinued but he said Emerald or Imprudence would work the same way – and you could do it with Second Inventory; while that product costs, you can import scripts as well). With full permissions of your object, you just right click the object, click more, and then select back up – this creates an xml file of your object. Name it, save it. Remember to make sure that all the parts of your object are linked when you do this. And since there is a max number of linked objects in SL (256), you might have to save a complex object in two parts. Once he saved the xml file, Isaac closed out of SL and went into the Education Grid (with the SL viewer) and, under File, clicked to upload textures + import, looked for the file, and uploaded it. In moments, his avatar built the imported object – and there it was, on the Education Grid. Massive inertia on the part of universities to make changes was noted. NRC has a good supply of policy-level resources about the way students learn, about the state of assessment, and on games and assessment. VWs offer more opportunity for constructivism, situated learning and communities of practice – an umbrella to address a range of solutions. Teachers need a rich palette of tools to be able to get to all kids and a full range of learning goals. It is difficult to assess learning in virtual worlds but you should attempt to map out what you’re asking students to do and measure that against the students’ participation in the vw. Recommendation to include students in any assessment of a program (what worked for you, how could it be better?). Think in terms of students’ mental models – what are they imagining? Bring up a simulation, frozen, and ask them what do you think will happen next? The Harvard post-docs talked about the Virtual Assessments Project (VPA) as a model for studying student performance in immersive worlds. One UK participant referenced the “e-portfolio” system used in the UK. Surely the fact that everything that happens in a vw can be logged can be exploited? “I’m not good at math but my avatar is..” direct quote from one of Peggy’s students. All in all, a fabulous day. My brain is full. Time to go home and decompress. We started the day with a bang – an absolutely fabulous talk from Jeffrey Schnapp (Director of Stanford University’s Humanities Lab). 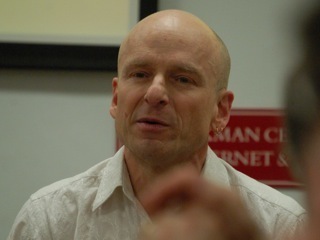 His talk was titled, The Augmented Museum. For me, this one made the whole conference worth the price of admission. Schnapp and his team have put together an online virtual exhibit, made by linking three, independent, discontinuous real life exhibits on the 3D platform called Sirikata, an open-source platform for creating virtual worlds. This is a WebGL-based environment that runs in a browser. First Schnapp gave us a good run down on what immersive environments mean for museums. He talked about a shift from museums’ traditional guardian notion of collecting (“we are the vault”), what Schnapp referred to as a “scarcity based model”, towards a new model of access and abundance. Schnapp described the new “augmented museum” in this way…. – it creates perpetually visit-able archives that compliment and traditional supports like catalogs, photographs and web sites. – it embraces interactive models of programming with an emphasis on bottom-up counterparts to more traditional top-down approaches. Schnapp showed us a movie of an instance using Sirikata to deliver a museum exhibit called “Speed Limits” (which has been staged in the real world, and will be in Miami Beach in September 2010). You start with a click on an email link in and immediately enter (without plug-ins!) 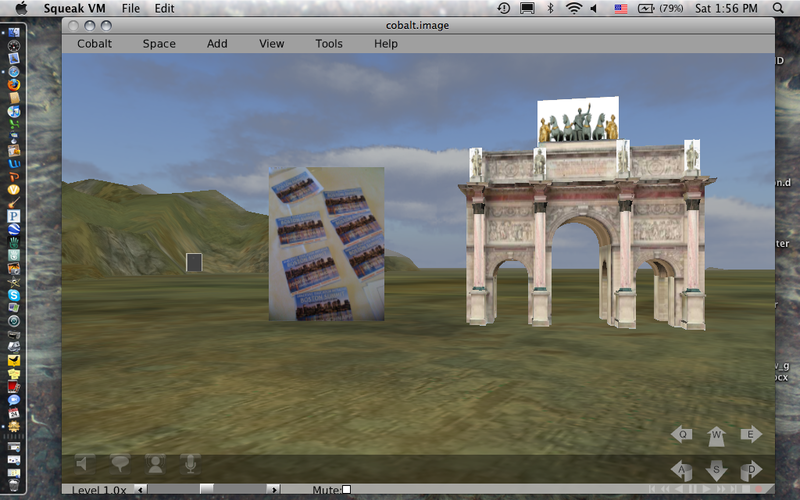 a 3D, navigable gallery of the exhibit. You can walk around, move the paintings, add a picture to the wall (from Flickr), resize it, add comments. Then, just for fun, the participant in the movie released a ball into the museum that knocked down all the paintings and created havoc. What fun for children. Just imagine the possibilities here – what a way to extend a museum collection for teaching, mashing-up, playing, exploration and creation. In addition to these fascinating insights into the future of museums was this notion of a 3D-world delivered seamlessly in a browser. Gone are the barriers of downloading clients, apps, or plug-ins – you just click and arrive. It is clear to me that the current virtual world entry barriers are just to high for the average participant (not to mention fleets of teachers and students) but the technology that Schnapp introduced suggests something much easier, more accessible, and much more inviting. Next up, Charles Morris (Virtual Helping Hands), Janyth Ussery (Texas State Technical College), Denise Wood (University of South Australia) to talk about the ways they’ve used Second Life in teaching, with a particular emphasis on working with the handicapped. Charles was there in person, Janyth and Denise were skyped in from their homes. Here were a few highlights…Dance in SL (dancing with an avatar), presentations with an invited international speaker, students creating games (each team given their own skybox on which they create their own immersive game), theater/opera staged in-world, as well as business and financial modeling. Janyth teaches two classes in SL – one on critical thinking and the other on business etiquette. In the etiquette class, they take the students out for a business dinner (in SL) to model appropriate business dining – a role playing experience that is moderated. Morris and Helping Hands work to improve the accessibility of SL for handicapped. To that end, they are working on their own SL viewer called Access Globe. Some of the features include text to speech applications, automated capturing, enhanced accessibility of menus, audio notification of on-screen events, visual notification of sound events, text list of avatars in the area for hearing impaired, and functioning without a mouse. Morris talked about Max, the virtual guide dog, an interesting project that is an assistive device to aid the handicapped in an immersive environment. Here’s a video of Access Globe in use. Next up, Nicholas Nagle from the Immersive Education Initiative with Transcoder Project. Nagle’s pitch was to establish standards and build code that will allow the independent deployment of content in immersive education platforms. He points out that 3D worlds on the internet today are walled gardens (as were online communities like AOL, Prodigy & CompuServe were before the WWW). Immersive Education Initiative’s Transcoder Project will allow you to create content that exists independently of the particular 3D immersive platforms so that the objects look and behave the same way, regardless of where they are deployed. So, for instance, with their Transcoder, you could take objects from Google’s 3D warehouse (objects developed in Collada) and deploy them in your virtual world of choice. The morning ended with a rather unsatisfying workshop-style “conversation” entitled “Towards an Immersive Education Core Curriculum in Higher Education.” Aaron Walsh did a heroic job of trying to lead/guide but it was too much like herding cats. Everyone talking/thinking/going in different directions with a few strong-minded and confident people taking over. Some useful gems though… importance of shifting focus from objects/plumbing to a focus on designing/creating experience as well as a few interesting thoughts on authentication/credentialing/certification. That brought us to lunch. And I think I’ll continue the afternoon’s reporting in the next blog post. 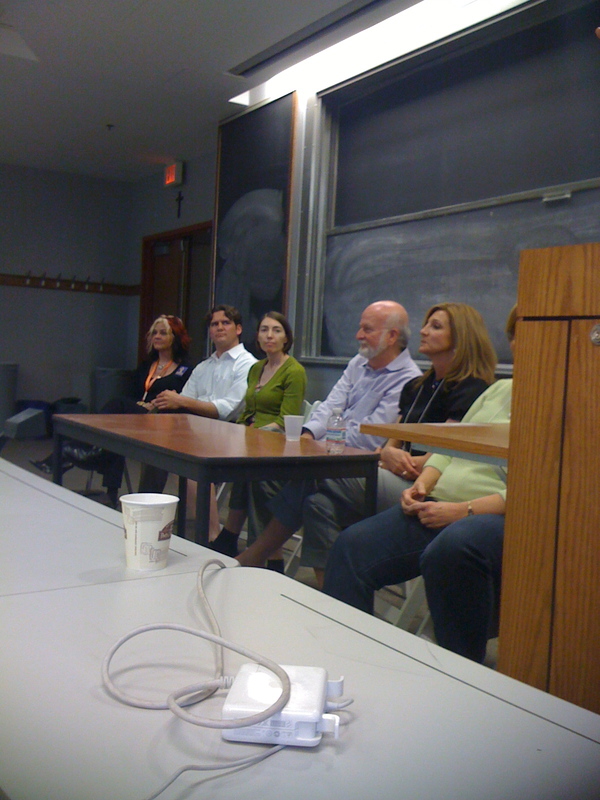 Wonderful first day (out of three) of the Immersive Education Institute, 2010 Boston Summit at Boston College. I attempted to tweet the conference – so you may also want to find those (twitter ID: rheyden). You can follow any of the feeds from the conference with the hash tag (#iED). The conference opened this morning with organizer, Aaron Walsh (Director of the Grid Institute) setting the stage with historical context featuring video tours of previous immersive environments. Then we moved on to Nicole Yankelovich, director of Project Open Wonderland (originally developed at Sun Microsystems). Open Wonderland is a completely open source java toolkit for creating virtual worlds. It is not a destination (like Second Life), rather it is a toolkit for creating federated, specialized virtual worlds, according to a modular architecture. With Sun’s recent acquisition by Oracle, Wonderland was cancelled. In a fascinating move, the original (now laid-off) Sun team has spun off a non-profit foundation to continue the work – Open Wonderland. With the move from Sun, all of their code, tools and support mechanisms were transferred to outside, open tools. For example, their code base is now on Google Code; their forum is on Google Groups; the old Sun Wonderland blog is now a blog on WordPress; they have a community wiki, and they have open developers meetings every week. Interesting, eh? Remains to be seen how Open Wonderland will be financially supported. Yankelovich showed us some amazing examples of builds using Wonderland code. For example, a virtual academy from Lockhead Martin for training mechanics and technicians; Greenphosphor’s virtual data visualizations; a dynamic 3D blog from Siemens, Ngee Ann Polytechnic’s virtual warehouse to teach accounting, MiRTlE from University of Essex (method for bringing remote students into a live classroom), the Wonderland Bicycle Game (featuring a wii remote on a bike) to help rehabilitate cerebral palsey patients, plus educational work by St. Paul College and the Birmingham City University. She also talked us through the basic features of Open Wonderland – application sharing, immersive (CD-quality audio), telephone integration, ability to import Collada 3D files, drag and drop just about every file type (pdfs, jpgs, pngs, gifs), and something I found very intriguing – the ability to set permissions on individual objects and places in order to carefully and differentially control security. So, for example, when you open an object, you can specify who (avatar names) can see it. They also have this interesting “cone of silence” ability to set a private area for conversations that cannot be heard by anyone else. I’m hearing more and more about these security concerns from my clients and collaborators. Next up was Julian Lombardi (Duke University), talking about Open Cobalt. This is a free and open virtual worlds platform and construction tool kit, developed at Duke University, built on Open Croquet. Lombardi did a good job of walking us through the basic features and capabilities of Cobalt – I was definitely intrigued – and we’ll learn more about that platform tomorrow. Following that, John Belcher (MIT) gave a great talk, describing the way he’s teaching physics to undergraduates at MIT. He’s designed a series of simulations to teach electricity and magnetism which are used at MIT, in a specially designed classroom. He’s now working to import those simulation objects into Wonderland. He chose Wonderland over Second Life because it’s open source (SL is proprietary), multi-user, immersive, and collaborative. It was critical for their project that they owned their build (he needed to control it completely). Also he explained that the Wonderland Toolkit is easier to work with than Linden scripting. Apparently OpenSim wasn’t available when they started the proejct 10 years ago. John’s goal here is to use the virtual world to show students the things that are all around them that they can not see (electromagnetic waves, in this case). He showed us a video of student avatars manipulating the simulation, displaying the field lines (and moving through them!). Very cool. John’s collaborator on a new NSF proposal, Jennifer George-Palilonis (from Ball State University) is a journalist, designer, and professor of multimedia – she talked about the importance of storyline. To help the students connect these physics simulations to each other and to the line of reasoning. She also talked about the importance of considering the instructional design, right along with the environmental design and the graphical design (the “look”) of the whole thing, so that it all works together to maximize the learning. Next up were Melissa Carrillo and Emily Key from the Smithsonian Institution’s Latino Education Center and their Latino Virtual Museum (LVM) in Second Life. Carrillo and Key started their talk with this prediction from Gartner Research Group: 80 % of internet users will be in a virtual world by 2011. These women see this as the next phase of the internet and, therefore, the place where libraries and museums need to be. They have a build in Second Life (three islands) that is open to the public. They feel that SL offers shared experiences, a feeling of presence, visual immersion, and real time collaboration. But there are problems – security issues and including children in the experience. They are now planning to expand their builds to Open Sim and the Grid Institute – they are not giving up on Second Life (they’ll maintain that) but will add these new experiences to their repertoire. In these virtual world builds, they want to explore the relationship between culture and the environment. They showed a nice machinima video, explaining the LVM eco-explorers design – immersive yourself, play and learn. They are using gaming strategies in their LVM build (based on national standards) – students go on a quest, immerse themselves in the environment, and play (as opposed to the first thing a curator has to say to you in a museum – “don’t touch!”). This is not to say that real life museums will no longer be needed – it is always important to be able to see the actual artifacts – but the virtual world offers the museum curators a way to extend their visitors’ experience to provide interactivity at the level of the object. Carrillo introduced us to their new project – Tales from the Blue Crab – a collaboration with the Grid Institute. They showed us a QT movie of a spectacularly rendered, photo-realistic, anatomically correct blue crab (rendered in Blender). The crab was a high resolution, scalable object. You can see the crab move, swim underwater (a constructed immersive underwater scene), and watch its feeding and defense strategies. You can observe it in isolation or place it in its environment. Very cool. At that point, I switched over to the K-12 track to hear Richard White, Immersive Education Developer for Greenbush Southeast Kansas Education Service Center. They have build spaces Open Sim (Snowglobe), Edusim, in Cobalt, and using Moodle. – what would we say about a child who was reading novels 5 hours a day? would we say they are “addicted to novels”? – don’t forget the military – they have been succesfully using this technology for 30 years. Whew! That was a looong one (sorry about that!). If you can stand it – more tomorrow!